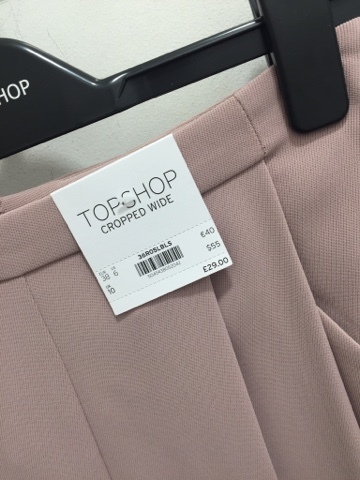 I quickly wanted to show you a few things I spotted in Topshop about 2 weeks ago. I know, I know...they're probably gone now but just on the off-chance they're not? 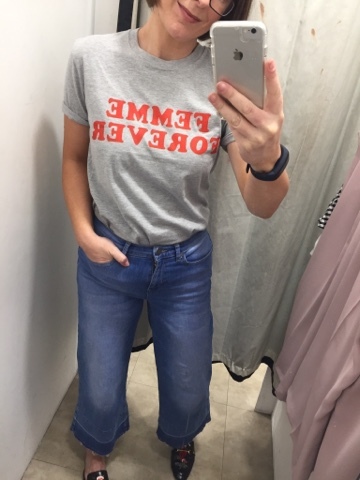 In any case, my secret Topshop tip is to go to the concession in Menarys in Bangor (not sponsored) because they often have stock that sells out faster in the city centre. Like the top I picked up myself which I'll show you in a minute but first, a couple of things that caught my eye - starting with this slogan sweatshirt. 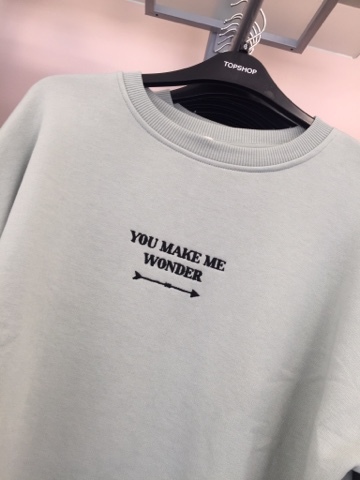 I struggle with slogan sweatshirts - love them but possibly because of my background in corporate communications, I find myself analysing the words too much to see what can be read into them and wondering what different audiences would make of each statement? Because of this, I only wear my slogan tops as loungewear. But I did quite like the one above and think it is quirky without making a random statement about myself, being a double entendre or drawing too much attention to my boobage. Here's the colour close up. I did love them but I had no tan on that day and they washed me out a little bit. I also have concerns about how it looks from a distance when you wear trousers this colour. Could it look like I've no trousers on? Have I ever told you how much I over think stuff? You probably guessed that by now. Anyway, they're a great price point and come in a few other colours - worth a look. The 10 fitted me fine. 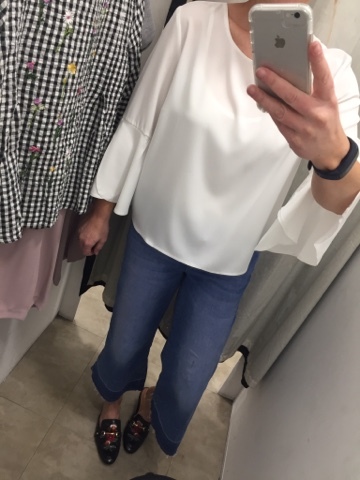 But all was good with the world once I tried on this top...which again, I'd seen lots of bloggers wearing but it had sold out online before I got round to ordering. 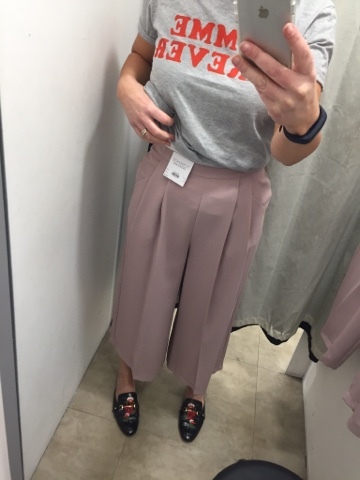 This is the 12 so it's a little on the big side but I don't think it matters with this style..
And here it is with a bit of tan and skinny jeans - which it works much better with. 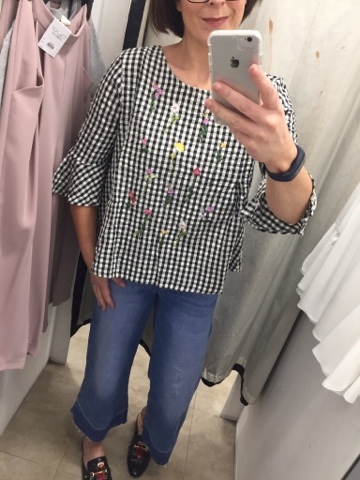 I think it's my most favourite gingham piece from the current trend. 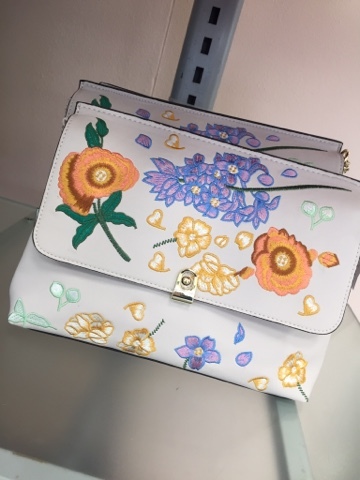 It's not too table-cloth-y and the embroidery makes it a bit more girly and day-time. Sorry it's not available online but I have had a few readers say they've found it in-store here and there so it's worth a look. By the way - if anyone sees sandals like the ones above in a shop anywhere, will you please let me know? They are last year's H&M and are wrecked after much wear. I would LOVE another pair...but can't find anything similar anywhere. So just on the off chance.